My Mum’s Wedding Photo My Holy Grail. This was sent to me on 30th December 2011 in an email from my new found cousin Diane, she is the daughter of my mum’s sister Lillian…….Wow !!! I could have just looked in the mirror and she would have been staring back at me! This was sent to me on 30th December 2011 in an email from my new found cousin Diane, she is the daughter of my mum’s sister Lillian…….Wow !!! l don’t take after my father in the slightest, l’m so relieved l’m nothing like him at all! l’m my mum’s girl for sure. Which convinces me that l must be like her…….I will never ever forget her, if fact I intend to immortalize her, by writing our story! I don’t know enough about my mum’s early life, but I will write what I know…..My mother, Dorothy Joan was born on 8th May 1929, the fourth daughter of Minnie May and William Henry Crumplin at 45 Stokes Hills, Farnham. Her father William was a war hero, but in civilian life was a gardener, not domestic. Her mother, Minnie May had been previously married to a Mr Lemon and she had a daughter with him called Audrey, this sister was a bit wild by all accounts! Minnie May lost her first husband, but quickly was remarried and had three more girls, Queenie in 1924, Lillian in 1926 and the youngest girl was my mum, Dorothy in 1929. Youngest of the family was Ron, he was about 5 years younger than my mum. l know my mum joined the Red Cross, so it’s possible, in fact highly likely that she was trained in Ash Red Cross Unit and is one of the cadets in this photograph, she would have been fourteen at this time and most of the girls look about that age. 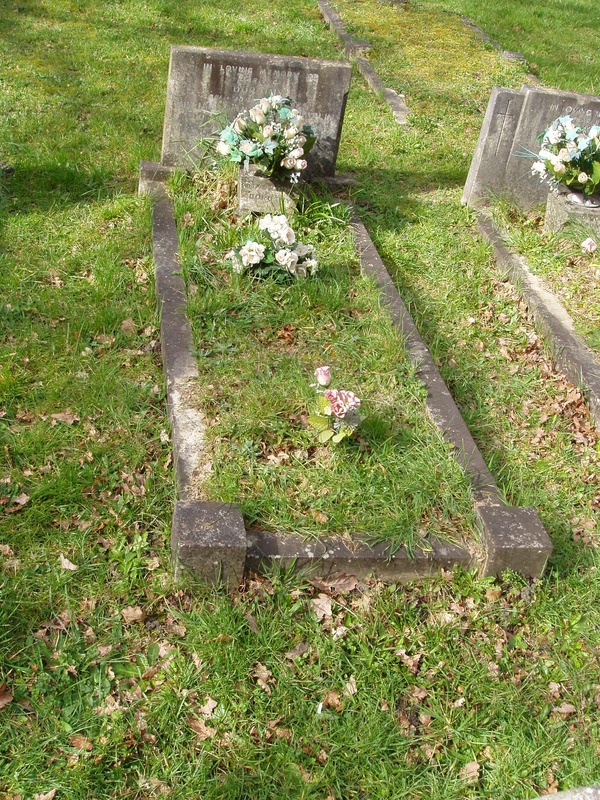 Eveline Hawkins was the Cadet Officer, Miss Hawkins taught many Cadets first aid and home nursing. 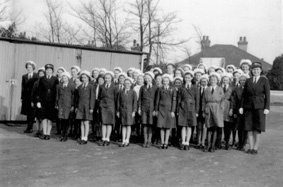 The Red Cross ambulance garages can be seen in this picture, behind the Cadets. The Red Cross base was on Shawfield Road, on the site now occupied by the Shawfield Day Centre. The nurses cooked the drivers light meals, which supplemented their rations, and often the record player could be heard playing the popular tune “In the mood”. During and after World War Two the strongest entertainment activity seems to have been the dancing clubs and regular Friday and Saturday night “Hops”. These occasions were a good time for boy to meet girl. With the Canadians based nearby during the War, many a girl was smitten by a Canadian soldier, some of whom stayed, others took our girls home with them. 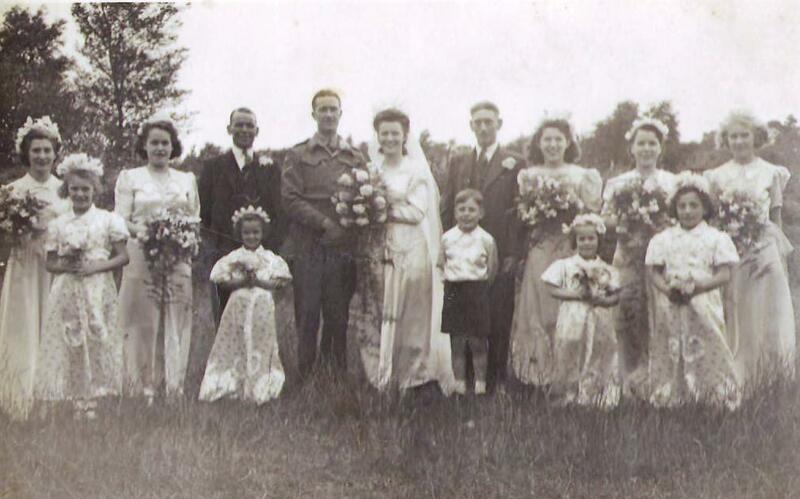 Auntie Audrey (my mum’s eldest sister) married Johnny Long in the Summer of 1945……….mum is the 3rd bridesmaid from the right at the back, she was sweet sixteen. Not sure of the date, but think she was the first to be married, but the most interesting point is Auntie Queenie And Auntie Lil married identical twin brothers. 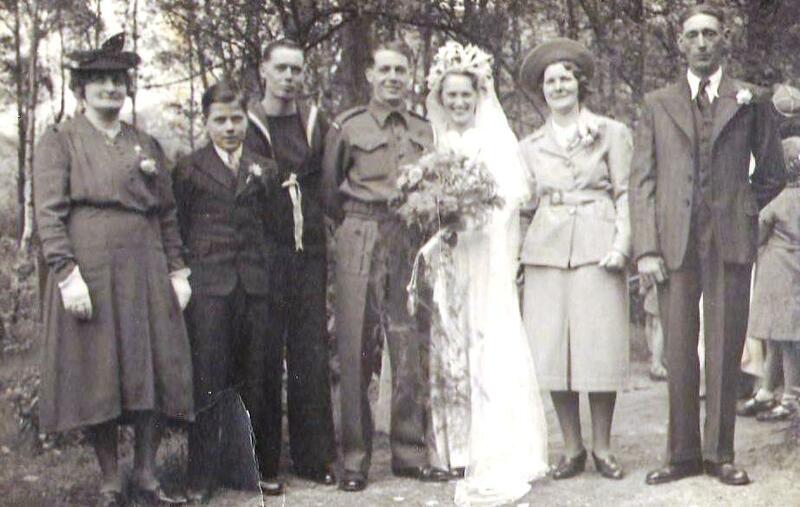 Of course they were best men at each others wedding……In this picture from the right is my granddad Bill, next to him my nan Minnie May, the bride, my Auntie Queenie, the groom, Stewart, then twin brother Doug. 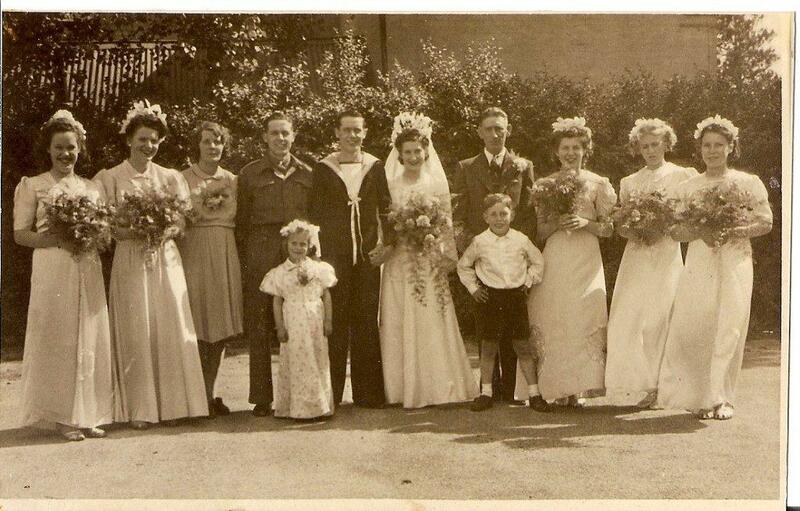 Auntie Lillian’s Wedding, (my mum’s older sister, my mum is 3rd bridesmaid from the right) Summer 1945. From left to right, those l know……Back row, 2nd bridesmaid Auntie Audrey, next to her my nan Minnie May, then the groom(Uncle Douggie), the bride (Auntie Lil) next to her is my granddad, then Dorothy (my mum) in front of my mum is Uncle Ron, my mum’s younger, only brother, probably about 10 yrs. 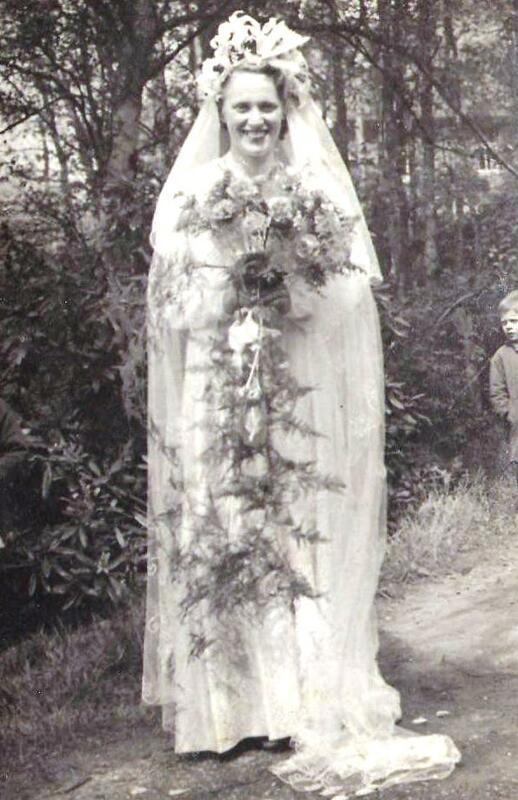 Auntie Lillian’s Wedding, my mum’s older sister, summer 1945. Lillian was 19 and my mum was 16. Audrey and Lillian married within a week or two of each other. Hence the similar line up and same bridesmaid dresses. 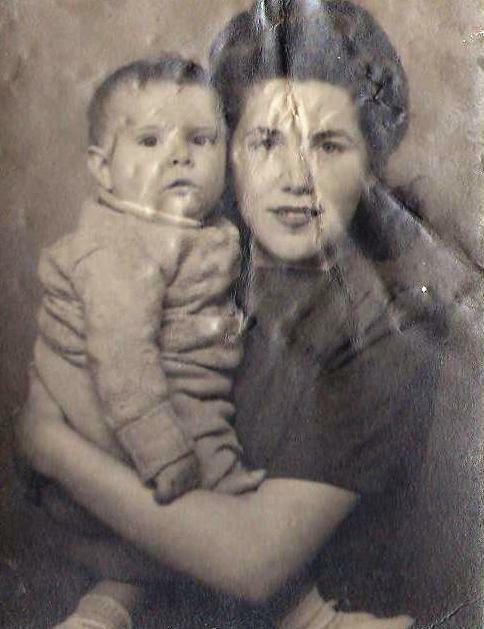 My Mum and her nephew Tony, he was about one and she was sixteen or seventeen. THE HOLY GRAIL – My Mother’s photo came to me after 55 years of wanting and waiting……..l was 61 when l finally saw it ! A long wait but worth it still ! My mother and father were married in 1949, my mum was twenty and my father twenty seven. I got this doc. for my mum’s signature and what a bonus my granddad Bill’s signature is on it too. Also my Uncle Doug too (Auntie Lil’s husband) l’m guessing he was best man? 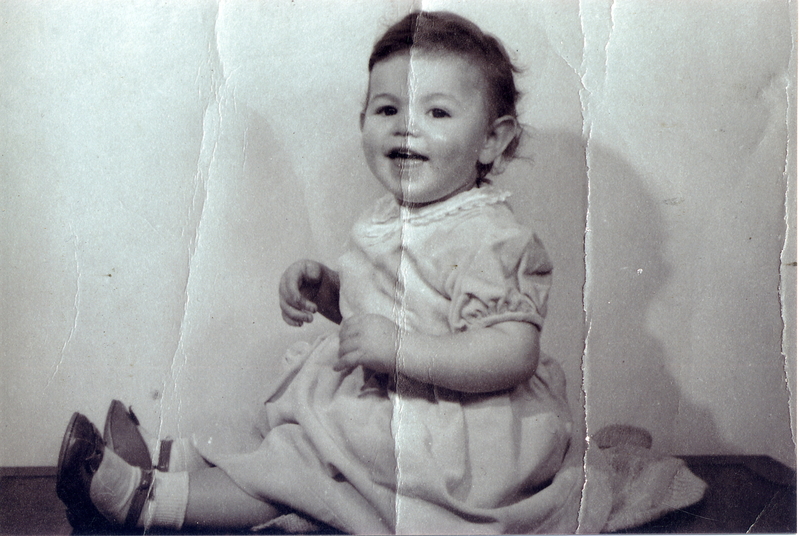 I was born 15 months later on the eighteenth December 1950. My mother and father were married in 1949, my mum was twenty and my father twenty seven. 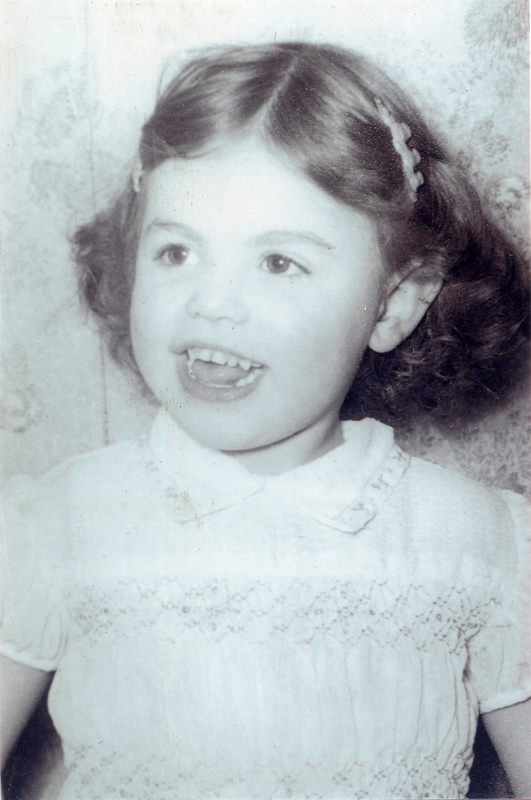 I was born 15 months later on the eighteenth December 1950. My first photo – This picture has been all over, it was sent to me by Tony, my real cousin, who took it with him to Australia, where he emigrated in 1972. Tony was my nan’s adopted son, which then made him my uncle, but he should have been my brother. Let me explain…..When my nan found out l was put into care she search for me, she wanted to adopt me too, it broke her heart, first she lost my mum, then she lost me. So in in my heart he’s my brother. l’m sure l can remember having this photo taken………l cried because l was scared of the camera, when they (the professional photographer) said they wanted to do the shot a certain way, l thought they meant shot or shoot as in a gun and l thought they wanted to shoot me!……..
We all lived in my Nan and Granddad’s house …….4, Arthur Cottages, Frimley Road, Ash Vale, Surrey, when l was born. 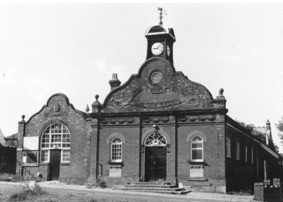 lt was opposite the first school that l attended; Ash Vale Primary School. My cousins and l all went to this school and l still have memories of learning and reciting all my times tables here. There were safety bars outside the school entrance and l always swinging and climbing on these, well until l was swinging on the top bar and smashed my front (baby teeth) on the bottom bar…..l was gappy for years lol. 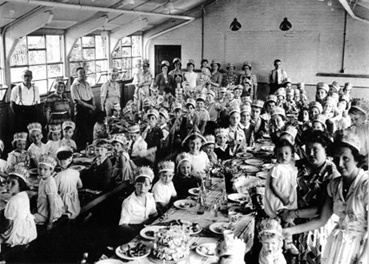 This is a photo of the celebration of the Queen’s coronation and it was held in Ash Vale Primary School. About a 100 children attended the tea party. l always thought that she had a road accident, that she was coming home from work on her bike and was knocked off by a lorry. This is partly true, but is more complicated than that. Apparently she had been having turns, literally speaking, she would turn to the left and collapse, this had happened about four times. On the day of the accident my mum was riding home from work and they think she had a turn and turned into traffic. My Auntie Lil says we were there, she had Mick (my cousin) and me and was just getting off the bus and she saw my mum’s bike in the road, she quickly took us to her house and dropped us off with Uncle Douggie. Auntie Lil ran straight back to the accident, but my mum was already dead. 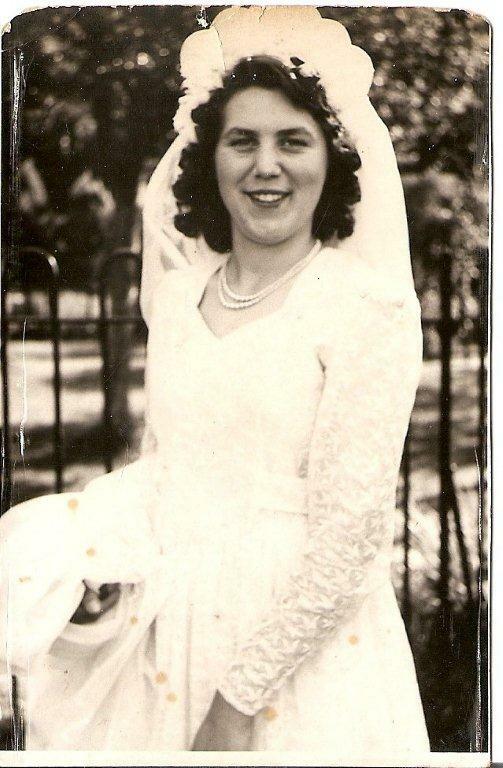 My mum was born on the 8th May 1929 and died on the 29th May, 1954. She was just 25 years old when she died. She left a loving family and was sorely missed. She had a little girl, Gillian, just three years old. Thank you for sharing your life journey. Amazing!